Alexa.com is the top most site used for checking ranking of your blog or website. It was founded in 1996 and later on acquired by amazon in 1999. Being a blogger your first goal is to improve your alexa ranking and you should definitely try to come in top 100 thousand sites of the world. Must Read :- Improve Search Engine Optimization of your blog to come in top 100K blogs. Find Commentluv And Keywordluv Enabled Blogs to get quality backlinks. How To Use Blog URL To Comment As OpenID and get backlinks. So, the first step to improve your alexa ranking is to claim your blog on alexa and submit your blog details. Well Alexa have its own algorithm is ranking every new blog or website. But submitting your blog manually to their database is the best way to improve alexa ranking of your blog. So, here is the complete step by step article on how to submit blog to alexa. Step 1 :- Visit alexa.com and click on "create an Account". If you already have an account on alexa. Simply, Login ! step 2 :- Enter you Email Address. You will then receive the confirmation link on your mail address. Login into your email account and then click on the confirmation link. Now you have to register yourself and then login. Step 3 :- Now to claim your blog with alexa. Go to Alexa site owner page. Step 4 :- Now you simply start filling your website / blog domain name and click on "claim your site" button. Step 5 :- On the next page you will get all the plans and prices of alexa site. But I recommend you to go with free account. So, click on Sign Up button under "Free Plan". Step 6 :- Now you will get 3 methods to verify your site's ownership with alexa. I recommend WordPress users to go with method 1 and Blogspot users go with method 2. Step 7 :- In method 1 you just have to upload the file. While in method 2 you will get one meta tag code. Just copy it. Step 8 :- Login to your blogger account. paste the meta tag code in <head> part of the template. Before adding meta tag please take the backup of your blogger template. Step 9 :- After adding meta tag in blogger template. Go back to alexa and click on "Verify My ID". If everything goes right, you will get the successful confirmation message. Step 10 :- Now add more details about your site like site title, site description, public contacts etc. Not only this, also submit your blog to Google Webmaster Tools and then also submit to Bing Webmaster Tools. It will help you in getting more organic traffic from search engines. So, this was all about how to submit and claim your blog / site on alexa. 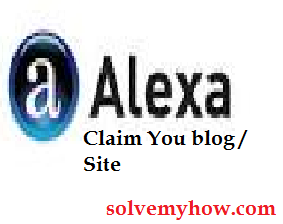 You must need to submit you blog / site to alexa to improve alexa ranking. Hope you found this article worth reading. Don't forget to share this tutorial with your social media friends. You can also Subscribe for SolveMyHow newsletter to get SEO and Blogging tips right into your inbox ! Does the claim thing still works? Of-course yes ! It works fine. Go ahead and claim your site with alexa. Its really useful and recommendable too ! Bro i have been learning so many tricks from your blog. but my comment are not working. secondly, Have you checked your blogger comments setting ? It might be hidden. Else also check template code, there must be some problem. Otherwise take backup of your template and upload it again. I understand your concern but alexa won't do such kind of things. If they want to sell paid plans then they must have to give free plans first. And even I checked it personally after you said but its working perfectly fine.